These two pups, a Havanese and a Dachshund, are gathered here today at the testing bench to try out a variety of fruits and veggies. You could say that they are acting as guinea pigs for food science! What an exciting event! It seems that they are happy to be here too, considering just how attentive they are! The pups were then offered the following selection: bananas, apples, onions, and some lettuce! Immediately here you can see how personality differences can affect what pups will and will not eat. 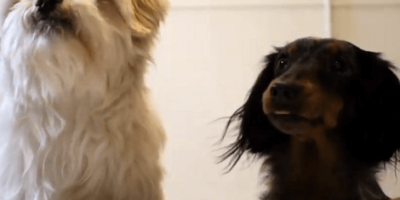 Milo the Havanese adores apples, but his Dachshund friend doesn’t even want to look at them!